Event marketing can definitely bring a lot of benefits to your business, regardless of whether you’re running a B2B enterprise or a B2C one. Of course, the event marketing plan and the types of event marketing ideas differ across various industries. 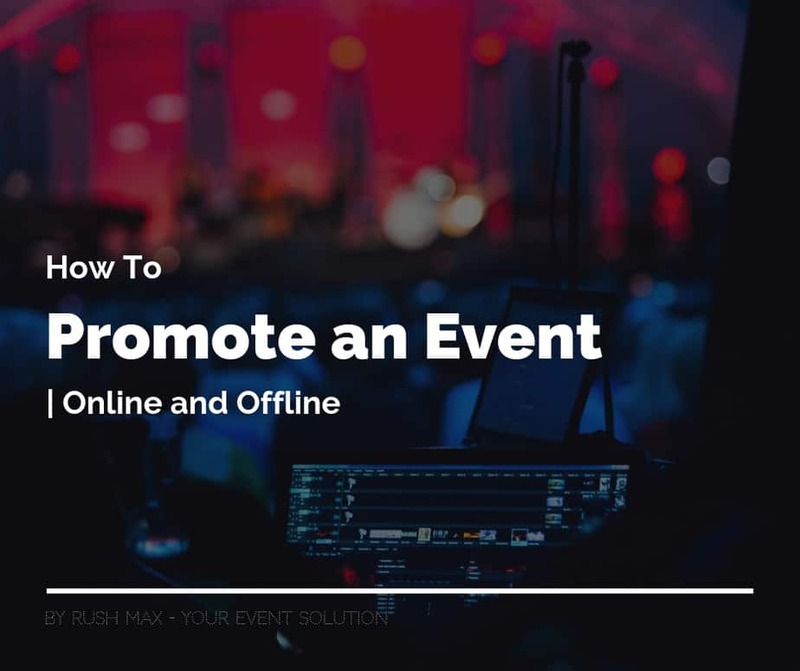 However, there are always similarities between the planning of a B2B or the promotion of a B2C event – and one of the major ones is connected to the fact that you absolutely need to promote your event. Planning it is obviously important – but without good event marketing strategies and promotion, your events will not get the traction they need to be actually efficient. Traditionally, most of the event promotion happened offline – through flyers and other offline means of communication. These days, however, event promotion happens online as well. Digital media has provided marketers with a myriad of options when it comes to creative ways to promote an event – and you too should take advantage of this as much as possible! What are some of the most important promotional ideas for events? What are the basics all event marketers should keep in mind when planning a roadshow? We have some tips for you – continue reading and find out more. In fact, Social Media is so huge that you’d find it a bit odd if you asked someone who’s online and they said they don’t have any kind of Social Media account. For you, as a marketer, this means a lot. It means that it is a very high chance your target audience will be on at least one of the main Social Media channels – and it means you can reach maximum ROI with your event promotion campaign without an investment that would break the bank. Influencer marketing is one of the most efficient ways to promote a product or an event online. There’s a very clear reason this always works: users/ consumers are more likely to believe the words of another consumer – an influential one for that matter. When you run an ad, for example, people may be more tempted to see it as what it really is: an ad, paid by a company that wants to promote its products or events. When you run an influencer marketing campaign, however, people are more likely to see it as just another one of their peers, giving suggestions and recommendations with regards to a product, service, or event. Social Media influencers – influencers on YouTube, Facebook, Instagram, Twitter, or LinkedIn (other Social Media channels might work, but these ones tend to be the most well-known ones). What are the benefits of working with influencers, as opposed to just running Ads, or other forms of promotion? It’s frequently less expensive than running Ads. Of course, the spending for influencer marketing depends on your industry/ niche and how popular you want your influencers to be. However, most times, running Ads can leave you short of thousands and thousands of dollars with little ROI, making influencer marketing the more beneficial option. Influencers have large audiences you will be automatically reaching to. Keep in mind that the more influential a blogger or a Social Media personality is, the more likely it is that the price for your promotional campaign will go up. Ideally, you should find the right balance between an influencer with an audience that’s large enough, but not too large to exceed your budget. Influencer marketing works. As mentioned above, people are more likely to believe a peer, rather than an Ad. Studies show that the average influencer engagement rate is of about 5.7 % (as opposed to 2-3 %, the engagement rate recorded by most brands present on Social Media). How to select the right influencers? There are numerous tools you can use to find Social Media influencers. Influencer Marketing Hub has listed 15 of the most popular free influencer tools in this article. Not all the tools listed in this article are created with the actual purpose of finding influencers, but some of them are and it’s worth checking them out. However, keep in mind that there are paid options as well (and they are probably more likely to show better results, as well as allow you to add more filters to your search). They need to be relevant, more than anything. This is where you start from: a pool of candidates that are actually relevant to your business. You wouldn’t want an IT reviewer to promote makeup products, just as you wouldn’t want your makeup products to be sold in an IT store. Your influencers need to be connected to your industry – and more than that, they need to be as non-general as possible (e.g. you wouldn’t want a YouTuber who speaks about everything from politics to lipstick to promote a new Software-as-a-Service product). They need to show good metrics. Reach (i.e. the number of followers the influencer has) is one important metric – but it most definitely isn’t the single, nor the most important one. It is far more crucial to make sure your chosen influencer has a good engagement rate (i.e. people comment and share their posts), as well as a good frequency of posting (for instance, there’s no use to work with someone who posts something new every now and again). They need to be authentic. If your influencers aren’t authentic, there’s absolutely no use in working with them. Remember, the main reason influencer marketing is so popular is precisely because it gives a humane touch to promotion – without the authenticity that makes a campaign feel friendly and real, your influencer marketing efforts will not yield the expected results. Undoubtedly, Facebook is one of the largest Social Media channels out there (if not the largest one). It’s a channel you should really look into precisely because everyone seems to be on it – from your General Manager to your grandmother, 90% of the people you know are likely to have a Facebook account. Creating an event on Facebook is crucial when you want to promote it on this social media. Beyond simply creating the event and inviting your contacts to it, there are many other things you can do. For instance, you can promote the event as an Ad. And most importantly, you can choose the specific audience you want to target in this Ad (including their geo-location). This feature is extremely useful when you want to plan the same event in multiple locations. By using it, you can promote your event to people who are located around the area of your choice (instead of spamming everyone else with it). This will help you increase the engagement rate (and more people will be likely to actually attend the event). Retargeted Ads are one of the best ways to run paid campaigns on Facebook. The way they work is quite simple: you install a “pixel” on your site (a special code), and each time someone visits your site and then leaves it, Facebook will display an ad for them later on. This is a great opportunity for those of you planning an event because it will allow you to remind website visitors that they can see your products and demos live, at a given date. Facebook livestreams can be extremely efficient in getting your message “out there”. You can stream a live video before the event to let people know about it (and maybe even show them a brief “sneak peek” of what will happen during the event). You can also stream a live video during the event to make people curious, to show off your products as they are exhibited during the event, or simply to provide those who couldn’t attend the chance to see your products/ services “in action”. Instagram is the second most popular Social Network, right next to Facebook. Depending on who your target audience is, their interests and their ages, you might find that Instagram is a more efficient channel of communication when you want to promote an event. These stories are similar to Facebook live streams. When you start a Live Story on Instagram, your followers will be automatically noticed by their app. If your main target audience is on Instagram (for instance, if you sell beauty products), it is definitely worth looking into this method of promoting your events. Instagram Stories are free to use and you can reach quite a lot of people to make them curious about your event. Creating a special hashtag for your event is a great way to increase brand awareness on Instagram. It is very important to be consistent about your hashtag, though. For instance, if your company sells beauty products and you plan on attending a big mall event, you would normally start promoting the future event on Instagram with at least a couple of months ahead of the big date. At that point, you need to decide on a precise hashtag you will use in your posts from the moment you start the promotional campaign to the moment the event ends. DO encourage your followers to use the hashtag as well. You can create contests and offer discounts for those who do so, for instance. Also, if you work with influencers, do make sure you share your event hashtag with them as well. This event promotion method lies between online and offline marketing. On the one hand, it is very similar to sending press releases as part of an “offline” marketing campaign. On the other hand, online press releases use different online tools to help companies reach out to online media outlets. When using this promotion method, you write a press release letting media outlets know that you plan on attending a particular event. You give them the details on what will be presented, what your company does, and what benefits visitors can reap if they visit your booth. You try to make your press release as interesting as possible (as this will increase the chances that they are picked up by more media outlets). Once your press release is ready, you can send it out to multiple media outlets at once, using press release distribution services. Some of these are free, whereas others are paid. Of course, if you are running on a tighter budget, you can use the free ones. But if you can afford spending the extra dollar and if you know you plan regular events, it would probably be best for you to pay for the premium press release distribution services. Creating a special landing page for the event might seem a lot of work. However, with services such as Instapage and Landingi, you can easily create a landing page even if you don’t have coding (or graphic design) knowledge. You can track your landing page’s performance quite accurately (using Google Analytics, you can track how many people landed on their site, as well as how much time they spent on site and how many of them converted into event attendees). Using a heatmap tool, you can see where your landing page’s visitors spend most time and where they don’t, so that you can make adjustments as you go. You can also promote your event as it happens – especially if will span on more than one day. Including visitors in fun activities is great not just for their engagement, but also for the people staying at home, still wondering on whether or not they should attend the event. Create a fun station for them. It could be a toy car race, or simply a photo booth. It could be a prize draw of some kind, or simply a video game station. Whatever it is, do make sure it suits your product and your target audience. This type of entertainment is bound to attract a lot of visitors to your booth – and you could take this opportunity to encourage them to share the photos of the fun activity on their own Social Media channels (using your hashtag, of course). Consequently, this will attract even more visitors to your booth. Bring in a photo booth and share the photos live, on a big screen, as a slideshow. Encourage visitors to vote for the best picture on Social Media and share it with their friends, so that they can vote too. This will increase your reach, attracting more visitors towards your business during (and after) the event. A good teaser video can sell your products before they’re even on the market. The more intriguing your teaser video is for the target audience, the more likely it is that you will make them curious. Keep in mind that teaser videos shouldn’t actually show anything. For instance, if you were selling cars, a teaser video would only show shots of the wheel, color, and so on – just enough to make people want to watch/ attend the big release and then want to buy the product. Teaser videos can be created for events as well – not only will they increase the exposure of your event online, but they will most likely attract a lot of visitors towards your booth too. In some cases, offline means of communication might work better for your business. If your main target audience isn’t online and doesn’t spend too much time/ doesn’t pay attention to various forms of online promotion, you might be better off promoting your event using traditional channels. Aside from leaflets and posters, it is also extremely important to let your booth talk about your business. The more unique your booth is, the more people will actually talk about it with their friends and colleagues, making them curious to come and see it for themselves. Dress in a way that makes you look special. Your entire team should wear some sort of uniform or distinguishing clothes. Make it something original, that goes in line with your brand and product (e.g. if you are selling a Japanese drink, you could dress in a Kimono or traditional Japanese clothes). Design an attractive backdrop for your event. This will allow you to catch the attention of the passersby visitors, increasing the chances that they stop by your booth and actually inquire about your products. Think out of the box when it comes to your event backdrop – it’s one of the best ways to make sure you attract plenty of people towards your business! Practice experiential marketing. Create fun, interactive booths that make people feel entertained. The more interactive your booth is, the more people will feel excellent attending it (instead of feeling simply “marketed to”). Use your booth to create hype on Social Media too, bridging the gap between your online and offline campaigns! Event promotion can be a daunting task when you don’t know where to start from and what to do. As long as you have a clear idea of who your target audience is, though, you should be able to find the right channels for the promotion of your event. Keep your brand in mind, and keep your budget close to your pocket too! Event promotion doesn’t have to cost a fortune – but not paying attention to your budget might lead you into financial trouble. More importantly, keep things creative. Most people are tired of being sold mere information, packaged the same way every single time. It doesn’t even matter what kind of business you run, how large your company is, or the industry you’re active in. At the end of the day, you are marketing to people (be them consumers or decision makers in a company). And people always appreciate creative campaigns that make them feel entertained and involved in the success of your company!